IOANNIS PASHAKIS/Sun-Gazette Top, Patti Jackson-Gehris, vice-president of Marketing for UPMC Susquehanna, Gabe Sinicropi, vice-president of Marketing and Public Relations for the Crosscutters, Vladimir Guerrero, MLB Hall of Fame Outfielder and a UPMC Susquehanna staffer, unveil the latest installment of the ‘Bases Loaded’ at the UPMC Susquehanna Williamsport Regional Medical Center Friday. Under brilliant, blue skies Friday morning, the third installment in a series of “Bases Loaded” statues was unveiled on the front lawn of the UPMC Susquehanna Williamsport Regional Medical Center. 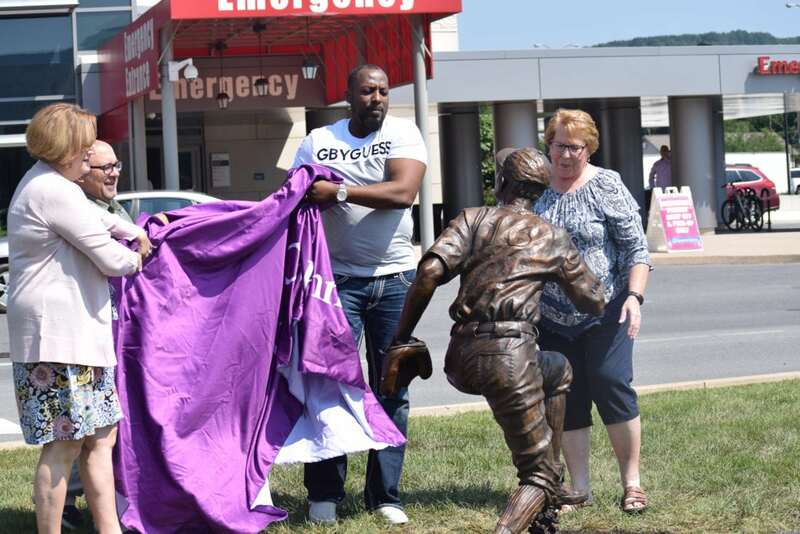 The bronze-cast statue of a right fielder joins others that were commissioned by the Lycoming County Visitors Bureau to mark the significance of Little League baseball in Williamsport. The statues will be done through 2021 when Little League baseball hosts the 75th World Series. 2015 the pitcher was placed at the Original Field on West Fourth Street. In 2016, the shortstop was placed in the plaza behind the Trade & Transit Center II and last year the right fielder was set at BB&T Ballpark at Bowman Field, according to Jason Fink, executive vice-president of the Williamsport/Lycoming Chamber of Commerce. Members of the Mexico Little League team were on hand when the most recent statue, wearing the emblems of the local hospital and UPMC Susquehanna, was revealed. “UPMC Susquehanna has not only played a vital role in providing the health care delivery system to our community, it has also provided expert medical attention to the youth playing in the Little League World Series for over 50 years,” said Fink, addressing the crowd that had gathered for the ceremony. 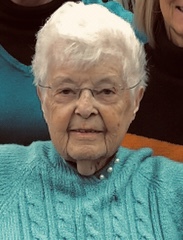 “It should be comforting to know for a parent that their child, who may be from half the globe away, is in excellent medical hands should the need arise,” he added. “Even though becoming part of UPMC is a recent development, Susquehanna has had a long standing relationship with Little League. We always provide services for the players at the ball field during the game. We work with them all throughout the year and getting ready for the Series. We feel that Little League is just a rallying point for this community, everybody comes around it. It’s a really positive message,” said Patti Jackson-Gehris, vice-president of market development at UPMC. 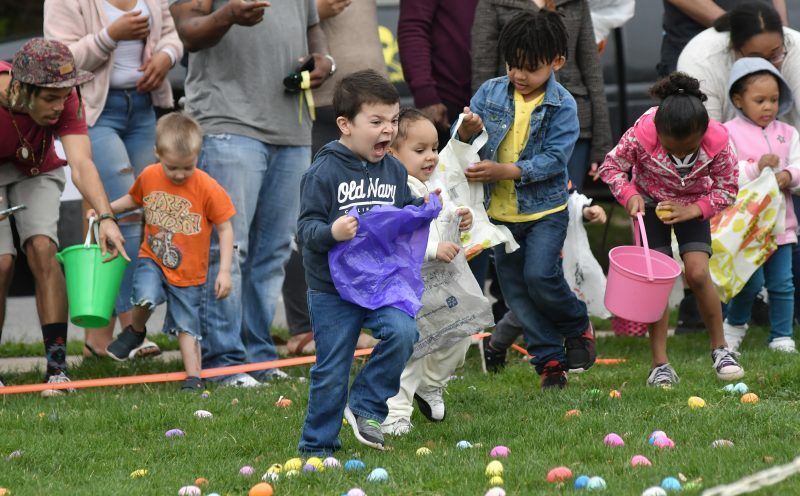 Gabe Sinicropi, Jr., vice-president of marketing and public relations of the Crosscutters Baseball team, said placing statues throughout the community encourages visitors to explore the area. “What better way to recognize our area as home to Little League Baseball than to erect statues that not only commemorate, but also tell, the story of Little League. The “Bases Loaded” statues not only represent Little League but they represent our area’s heritage. How lucky are we to live in one of the literal foundations of our national pastime,” Sinicropi said. Participating in the unveiling were Sinicropi, Jackson-Gehris, Amy Brooks, of the Williamsport-Lycoming Visitors Bureau and Vladimir Guerrero, MLB Hall of Fame and retired outfielder with the Los Angeles Angels, who is in town for the Series. Following the ceremony, Guerrero participated in a game of wiffle ball on the hospital lawn with members of the team from Mexico and community members. The statues were created by artist Matt Glenn, of Provo, Utah.